Following up on your request in the "Old Bits That Still Work - Muncie Transmissions" post, I feel just as strongly about the competence of a Chevy 12-bolt rear end for use in today's vintage racing. Like our Muncie, we've run the same 12-bolt rear in my Camaro for the past 11 years. It's been rebuilt once, but was showing only very moderate wear. My 12-bolt uses a factory style, Salisbury/clutch type, limited slip. This same 12-bolt came with the car when I purchased it, and it had already had the housing ends modified for "c-clip eliminators." Not a bad idea if you're concerned about safety, or what could go wrong without these axle capturing devices. I'd also note, to insure less issues at the track, to vent them better. I use the stock location where the plastic tube-and-cap style item goes in the center section. I pressed in my own short tube, that then accepts a hose, which runs to a breather/catch can in the trunk. Without the venting, like the Muncie discussion, the built up pressure may push out 90-weight.. Perhaps out of the stock vent/cap if you leave it with the factory piece. Though I too am not a fan of Ford 9" rears in first-generation Camaros, I do understand why folks try to keep/warrant/justify them in their cars. Beyond being a very stout piece, a 9-inch makes it a bunch easier to swap gear ratios. For those running vastly different tracks, perhaps multiple times per year, you'd almost want to have two complete 12-bolt axle assemblies to aid the effort. The Ford guys have it a bunch easier with the ring and pinion being carried in a drop-out pumpkin. Thanks, Chad. I appreciate you sharing your thoughts. For racers who think the 12-bolt is not a strong enough piece to race with, that is a fallacy. The Ford 9" is a very strong unit and does allow easier gear changes however, I don't believe there are vintage racing guys changing ratios from one race to another. Also, I hear the Ford 9" has slightly more parasitic horsepower loss than than a 12-bolt. There is precedence for guys running Ford 9" rear axles in Camaros and there is even one that I know of that used a Chrysler 8-3/4" rear axle. That is because of a rule change for the 1970 season that allowed racers to use rear axles from rival manufacturers. Why the SCCA felt they needed to make this change, I don't know, but they did. With that being said, nothing but a 12-bolt rear axle was used in a Camaro in the 1967-1969 years and that includes the Penske cars. 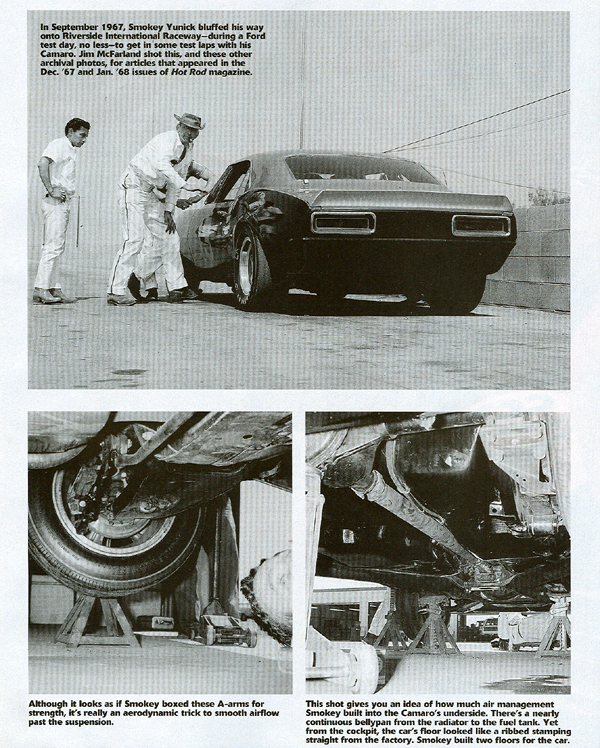 Also, the vast majority of Camaros running in Trans-Am up through the "classic era" cut-off year of 1972 continued to utilize the GM 12-bolt. Jon, I agree with all your statements except the bit where you state that you "don't believe there are vintage racing guys changing ratios from one race to another." The well used 4.56 gear for Laguna Seca and Sears Point, coupled with the tire diameter that is required in the "Historic Trans-Am" group, would be a questionable choice for other west coast tracks like Thunderhill, Portland and Seattle. Thunderhill, Portland and Seattle have longer straightaways, and your motor's rotating assembly would prefer a taller gear. Thanks Chad. I stand corrected. Are you changing gears (or complete rear axle assembly) for those tracks or is it primarily guys with Ford 9" rear ends that are doing that? I've never run those other west coast tracks (Thunderhill, Portland or Seattle) with the Camaro... with a minor reason being the amount of time and effort needed to swap gears/rear ends. I've taken other cars with better suited gearing to Thunderhill and Portland. Both great tracks, as is Seattle, though I've only spectated there. I rememeber that when we changed the rear end assembly at Lime Rock to 4:56 on the Saturday night from 3:73 I picked up an easy 2 seconds within ony a few laps - was for the 73 T/A race when we still had the 302 in our 69 car. Many of the camaro guys just carried 2 or 3 complete assemblies with them to the tracks. 4:56 would have worked great also at Bryar. That's a bunch of baloney that has never been documented as being factual. The only Trans-Am race that Smokey's car ran was Sebring in 1968. This was his third try at passing tech inspection (tried at Riverside in '67 and Daytona in '68 before that) and he kept having to do more corrections until he finally had the car acceptable to race. Somehow somebody did not catch a 12-bolt cover on a 9" rear axle? Total BS. I have read that the car was restored with the 9 in Ford rear and chevy 12 bolt cover but I am not sure it that is correct. I clearly see the cast iron center section and the axle tube; doesn't look like a Ford rear to me. The rear cover does look odd though. Also note worthy is the 67/ 68-9 single leaf rear shock plate. If he was so concerned about weight/air flow why is the parking brake cable bracket still evident on the floor pan? The front of the leaf spring also wraps in the opposite direction than a production spring.